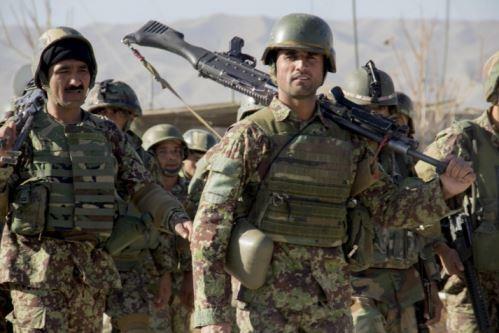 ANA Soldiers of 201st Afghan National Army Corps in eastern Afghanistan. (Photo by CPT Grace Geiger, 3d Cav Regiment, Dec 27, 2016). Expeditionary Advisory Package. For the past few years the U.S. military has been utilizing an Expeditionary Advisory Package (EAP) model to advise Afghan National Defense and Security Forces (ANDSF) elements at a few of the Afghan National Army (ANA) corps and Afghan National Police (ANP) police zones. During the 2014-2015 drawdown of U.S. (and other Coalition forces) it was determined that Coalition trainers and advisors were not needed to conduct the Train, Advise, and Assist (TAA) mission at the 203rd and 215th Corps (and the corresponding Police Zones of 303 and 505) on a full-time basis. The Expeditionary Advisory Package was initially designed to conduct the TAA mission from a centralized location (Kabul) sending the EAPs to the 203rd and 215th Corps areas as needed. These original EAPs were known as Advise and Assist Cell – Southeast (AAC-SE) and Advise and Assist Cell – Southwest (AAC-SW). The AACs came under the control of the Advise and Assist Directorate or ADD based at Camp Resolute Support in Kabul. In time, EAPs were pushed from Kabul to other areas to perform functionally-based advising or to respond to strategic emergency situations (as in the fall of Kunduz in 2015 and 2016). The latest DoD 1225 report (Enhancing Security and Stability in Afghanistan, December 2016, page 10) provides a statement explaining the purpose of the EAP. TAACs. In the other parts of the country the corps and police zones are advised full-time by Train, Advise, and Assist Commands or TAACs. The TAACs are a very slimmed down version of the old regional commands. With the drawdown it was planned that advising was only to be done at the ANA corps and police zone level or higher level. The ANA levels below corps include brigade, kandak (battalion), and tolay (company) – with the exception of SOF and aviation units. The TAACs are headed by ‘framework nations’. The U.S. heads up TAAC East (201st Corps) and TAAC South (205th Corps). The Turks head up TAAC Capital. The Germans (assisted by many other European nations) run TAAC North (209th Corps). Italy is fielding TAAC West (207th Corps). Task Force Anvil (SE 203rd Corps) is U.S. as is Task Force Forge (SW 215th Corps). In additional to the corps the TAACs are also conducting the TAA mission with the corresponding police zones in their region. Optimistic Assessments of ANDSF. The (incorrect) assessment that led to advisors working at levels ‘no lower than corps’ was fueled by optimistic reporting on the part of military leaders of the United States and other Coalition nations of the ANA being able to conduct operations effectively at the tactical level. The various reporting mechanisms (CUAT, RASR, MAAR, etc.) used by the Regional Commands (and now the Train, Advise, and Assist Commands) did not adequately take into account the corps, brigades, and kandaks ability to conduct tactical level counterinsurgency (COIN) operations effectively. Those aspects of the reports that did concern itself with a tolay or kandak’s combat effectiveness in a COIN environment were subjective in nature and usually saw the units score improve incrementally over time even though they were not fighting any better than they did one or two years previously. Timeline vs. Conditions. In addition, a driving factor to the ‘no lower than corps’ advising effort was the recognition by senior military leaders that the Obama administration’s commitment to Afghanistan was based on time not conditions. Aligning the force structure of U.S. and Coalition trainers and advisors with a cap of 9,800 U.S and a few thousand Coalition forced the issue of advising only at the corps level and above. The ‘time-based withdrawal’ approach prevented senior military leaders from being honest with themselves and each other about the poor progress of the ANDSF. A sentence from the ‘Executive Summary’ of a recent report by the Center for Strategic & International Studies is telling. Reality on the Ground. We have seen the results. The ANA was not quite ready to lose mentors and advisors at the tactical level (brigade and kandak). The ANA did not perform to those optimistic expectations aired in public proclamations by the International Security Assistance Force (ISAF), the U.S. Department of Defense, senior NATO officials in Europe, a the Obama Administration. The Taliban control more territory now than any other time since 2001. The ANA has taken a significant amount of casualties the past few years and suffers from corruption, ineffectiveness, and poor leadership. Need for Advisors at Tactical Level. Resolute Support is sending advisors down below corps . . . once again. Expeditionary Advisory Package deployments have been taking place at the 203rd Corps and 215th Corps on a regular basis. However, a recent development (as of 2016) are the EAPs working at brigade level (on a temporary short-term basis) at almost all the other corps around the country. In addition, some EAPs are responding to specific emergency situations that the Afghan National Defense and Security Forces (ANDSF) are incapable of or are having difficulty in responding to. In late 2016 it was noted by Resolute Support that each of the existing TAACs either had or were in the process of establishing their own internal EAPs. EAP Model. The mission and duration of the EAPs is situational and flexible. Some EAP missions will last only a week – such as when an EAP deploys to assist one of the corps or police zones in a functional area. Other EAPs can be as long as several weeks assisting in a long-term ANDSF operation or responding to a operational crisis – where warfighting assistance and facilitating enablers is provided. Troop Level Needed for Effective Advisory Effort? With a reduction of troop strength by the Obama administration from 9,800 to 8,400 one wonders just how much coverage can be provided by these EAPs. Is 8,400 U.S. enough? What should our force strength in Afghanistan be in 2017 so that enough of these EAPs can be deployed on a frequent enough basis at brigade and perhaps kandak level to make a real difference? 8,400? 9,800? or 20,000? The exception to the ‘not advising below corps level’ has been the use of U.S. and Coalition SOF working for NATO Special Operations Component Command – Afghanistan / Special Operations Joint Task Force – Afghanistan (NSOCC-A/SOJTF-A) to advise the Afghan Special Security Forces (ASSF) or Afghan SOF and the aviation advisors working for Train, Advise, and Assist Command – Air (TAAC-Air) doing the ‘train, advise, and assist’ mission with the Afghan Air Force (AAF) and the Afghan Special Mission Wing (SMW). Above corps level advising takes place at the institutional level (functional training branches, officer schools, etc.) and the Afghan security ministries (MoD and MoI). See page 2 of The Trump Transition and the Afghan War: The Need for Decisive Action, by Anthony H. Cordesman, Center for Strategic & International Studies (CSIS), January 5, 2017 for the quote referenced. The EAPs for the 203rd and 215th now work in conjunction with the recently established Task Force Anvil (southeast) and Task Force Forge (southwest). These Task Forces are a more permanent presence than the EAPs but are not quite TAACs. The EAPs provide a command and control element and functional specialists on an as-needed basis. The EAPs focus “. . . on sustained ANDSF progress in performing the eight EFs, assisting with typical warfighting and policing functions and operations, or to address other enduring or emergent ANDSF capability gaps as appropriate.” (page 17, DoD 1225 Report, Dec 2016). Note: An EF is an “Essential Function” – a methodology where the train, advise and assist effort is organized into eight distinct functional areas to facilitate the TAA effort at Resolute Support HQs. For instance, in the past year an Expeditionary Advisory Package has been sent to troubled locations like Farah province, Kunduz city, Uruzgan province, and Helmand province to respond to what could be a strategic failure on the part of the ANDSF. As an example, Kunduz city – the capital of Kunduz province – has repeatedly seen Taliban offensives that resulted in temporary control of the city. A huge black eye for the ANDSF. It was only through the efforts of Afghan SOF units (advised by U.S. and NATO SOF), U.S. airpower, and EAPs from Kabul and Mes-e-Sharif that the city was recaptured from the Taliban in the fall of 2015 and fall of 2016. Read more about the job of the Expeditionary Advisory Package in a news release entitled “This time it’s different”, DVIDS, January 5, 2017.This news release by the 3d Cavalry Regiment’s Public Affairs Office provides a detailed description of how an EAP from Train, Advise, and Assist Command – East (TAAC-East) working with the 201st ANA Corps in eastern Afghanistan is advising at brigade level. Read an Army news release about an Expeditionary Advisory Package sent to the 203rd ANA Corps in December 2014 in “Army, USMC generals talk Afghanistan transition on expeditionary advisory trip”, Army.mil, December 20, 2014. See a news report about a 100-man ‘expeditionary advisory package’ sent to Helmand province to assist the 215th ANA Corps in securing Lashkar Gar when the provincial capital was under threat by the Taliban in August 2016. “US Sends 100 Troops to Key Afghan City Under Taliban Siege”, Military.com, August 22, 2016. Read a Department of Defense news transcript (DoD, Aug 25, 2016) that describes an expeditionary advisory package sent to train, advise and assist the provincial police zone headquarters in Helmand province. Feature Photo: The photo at top of page is of soldiers assigned to the 201st Afghan National Army Corps returning from conducting collective training near Camp Torah in Sarobi district, Afghanistan, December 27, 2016. The training, with assistance from a TAAC-East EAP, was conducted as part of the corps winter campaign strategy designed to build capability and capacity. (U.S. Army photo by CPT Grace Geiger, PAO, 3d Cav Regt. ).